Raglan has an environment that is very conducive to active recreation. There is a myriad of recreational activities in Raglan. This is a reflected on a daily and weekly basis when people from out of town come here for recreational activities. During the Summer the town is swelling to its capacity with people pursuing relaxation and active recreation. Raglan has world class surf breaks, offers harbour recreation, has beautiful bush walks and bike tracks. The 2013/14 Active New Zealand Survey showed that 74% of adults (2.5 million) take part in sport and recreation weekly and 94.2% at least once a year. Walking, swimming and cycling are the most popular. Time and cost are the main barriers to not doing more sport. Land activities (gardening, horseriding (Pony Club), hunting, rugby, golf, running/hiking/tramping, netball, rock climbing, badminton (Badminton Club), Blowkarts – land yachts, bowling and indoor bowls (Bowling Club), croquet, dance, kapa haka, exercise classes/gym, martial arts, netball). The New Zealand west coast has very powerful swells, with waves predominantly arriving from the southwest on the Whaanga coast. The predominant wind is also from the southwest. The surf wraps around Tirohanga and bends along the coast towards Whaingaroa for approximately 2ks. Karioi Maunga lays majestically in the landscape and affords a semi sheltered environment for the coastline and surf areas. The left hand point breaks are comprised of volcanic boulders that go out to approximately 6m depths and has a steeper gradient that assists to increase the power of the wave along with creating a more consistent wave due the rock bottom. Those characteristics on the Whaanga coast create some of the best surf breaks in Aotearoa. The Whaanga Coast surf breaks are recognised in the New Zealand Coastal Policy Statement 2010 as being nationally significant along with being world renowned. Because of the quality of surf and the uniqueness of the environment, there is a community of surfers who are proactive in protecting and managing their space. Whaingaroa for many decades has become a destination for surfers who realise the uniqueness of the coastline and the surrounding area. Surfers are diverse group young, old, female, male, rich, poor, able and disabled all choosing surfing as a way to engage with their environment and recreation activities. Surfers make a large contribution to the Whaingaroa community either in business activities or through cultural, social and environmental organisations. Whaingaroa has a natural and unique surfing environment and it offers plenty of opportunity in varied conditions. Ngarunui beach is the nursery break for beginner surfers. The Surf club has the nippers program that gives beginner’s confidence in the sea and surf. Beginners advance to surfing first Manu Bay, then Whale Bay then to Indicators. Advanced surfers then move to Tirohanga. The Raglan Area School has a Surf Academy as part of the school curriculum. Point Boardriders is affiliated to Surfing New Zealand has been in existence for many years and has held club competitions at Manu Bay as part of the surf competition rounds. The Manu Bay competition event calendar is set in place by the Coastal committee, Point Boardriders and the Waikato District Council. The event calendar has to take into consideration the sharing of the Manu Bay space with other surfers. Whaingaroa is also the home base for marine scientists such as eCoast which operates globally and provide expert technical and advisory services to both public and private sector clients. Metocean Solutions is another company that specialise in oceanography and meteorology. In 2016 council revised its walking strategy, but, although the maps of Raglan appear to offer some interesting new routes, it’s not planned to spend anything on them until at least 2022 (unless we successfully submit to the 2018 LTP) and the strategy is due for revision in 2021. It does though say, “Council will ensure unformed legal roads are not blocked”. These form significant networks around Raglan, as can be seen on the Walking Access Maps. Land activities: (gardening, horseriding (Pony Club), hunting, rugby, golf, running/hiking/tramping, netball, rock climbing, badminton (Badminton Club), Blowkarts – land yachts, bowling and indoor bowls (Bowling Club), croquet, dance, kapa haka, exercise classes/gym, martial arts, netball). Tennis courts by the rugby grounds, courts at Te Mata school and courts at Raglan Area School? Raglan Mountainbiking Club, Cyclery Raglan, Raglan Events and Multisport Trust. Karioi Classic cycling event. Te Ara Kakariki mtb trails. Papahua pump track. Pipiwharauroa trail to windfarm. Roadside cycling. Whaingaroa has not been immune to national and global influences in terms of the changes to the various methods of equipment use that is undertaken in the surf zones of the Whaanga coast. Foil boards, Stand up paddle boards (SUP) jet skis, kayaks and wave skis are becoming more regular in the surf. Surf Schools have also got established and are increasing in number on the coast. Whaingaroa for many decades has become a destination for surfers who realise the uniqueness of the coastline and the surrounding area. Accommodation venues have increased over the last number of years to cater for the increase in population and surf tourist influx. While surf tourism does have an economic benefit to the community, it does need to be managed to avoid adverse impacts such as overcrowding in the surf breaks. AirBNB is an online app based portal that allows for individual rooms to be let for accommodation that adds to the availability for added tourism. New subdivisions are being created to cater for more residential areas for current and future growth. Surfing relies on its environment and climate change and sea level rise has the potential to radically change the Whaanga coastline and to destroy the surf breaks. Water pollution, plastic in the ocean and storm water outlets along with waste water discharge to ocean is manmade. Effects to human health and aquatic life forms are part of the mix of adverse impacts. Physical impacts such as boat ramps, breakwater and marina pose a threat to the surf breaks on the coastline. Activities like aquaculture along with offshore wind farms and marine energy generation could impact the swell corridor and cause large decrease in swell pattern and size. Seabed mining on the coast could also change the hydrological processes of the coastline. Overcrowding of the surf line up is an increasing issue along with commercial activity. International Surfers who are not familiar with local protocol in the surf zone do cause major challenges to wellbeing of local surfers. The local youth of Whaingaroa need better transport out to the beaches and back to town. Additionally, Local council land use approvals and government policies can impact on the coastal environment. RFC has grown to the point that we can’t fit any more teams and pitches at the Domain and is really a juggling act trying to fit every game in on Saturday . Storage shed is also bursting at the seams and the club is looking into upgrading. Drainage of the grounds is an issue which will only get worse long term with rising sea levels. Tennis courts by rugby club are relatively new and in good condition but very exposed to wind and planting shelter trees on perimeter would increase its usage. Both Te Mata and Raglan Area School courts need maintenance. Need to get kids playing tennis at school again in order to grow the sport. Mini court at Papahua gets overcrowded in main season and holiday periods. No official size indoor court to play in winter months. We have the beaches, Wainui Reserve, Kaitoke Walkway, Karioi tracks, Karamu Walkway, Pipiwharauroa Way and a few other, mainly unsignposted tracks. Road safety for cycling, no specific cycling lanes, paths. Linking Raglan township to mtb trails and beaches/surf points for cyclists. How does this challenge impact on Active Recreation? How does Active Recreation impact this challenge? What is the opportunity for us in Active Recreation in relation to this challenge? – The wastewater treatment plant has a high quality standard post treatment. 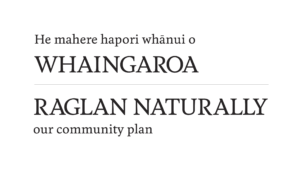 Protect the Whaanga coast and maintain a wild coastal landscape. Manu Bay to be free from additional building development – Manu Bay, in terms of commercial activities, is the place for surf competitions only. – Surf school activities are kept to Ngarunui beach. – Consideration for the Whaanga coastline to become an indigenous coastal surf reserve Contribute to the Transport reviews. – Transport services to beach and back for our local youth. – Provision of a shuttle bus service between Wharf and Manu Bay during the Nov-April (est. 30min journey including stops at the Recreation Sports Park carpark, town centre, and Manu Bay). Recreation is safe – Create a separate foil board zone to allow for separation from established surfing zones. – Basketball. There is room for expanding mini court at Papahua. Presence of a full indoor court would enable local teams to play competitions and host tournaments. ● Rangitahi development will include walking and cycling tracks. These could be linked to Wainui Reserve and to Raglan to create a safe cycling network around Raglan. ● Walkway/ mountain bike track build on paper road off Wainui Rd to DOC land on Karioi and across to Te Hutewai Rd. ● Low traffic / off-road route to cycle to Waikato, possibly via Plateau and Fillery roads. ● Footpath/cycleway along Wainui Rd to Riria Kereopa Memorial Dr – City to Sea cycleway widening the footpath to allow for shared use alongside Wainui Rd. ● Get the Council’s Walking Strategy implemented and contribute when its next up for review (2021).